New Braunfels. Fast-growing Central Texas city. Most likely the only American city founded by a Prince. Settled by Germans. If you live in or near New Braunfels, you probably know this. Here at the Sophienburg Museum and Archives, we tell the story of New Braunfels every day, but did you know our beloved “Beauty Spot of Texas” was a Plan B? During the 1840’s, Europe was in turmoil both economically and politically. Noblemen from several German states decided to “help relieve” overcrowding by colonizing the new Republic of Texas (as England had done in America). They created the Verein zum Schutz deutscher Einwandrer in Texas (Society for the Protection of German Immigrants in Texas) or simply, Adelsverein (Society of Noblemen). Prince Carl of Solms-Braunfels was selected to go ahead to secure the needed lands and provisions. The Adelsverein was able to recruit many countrymen who desired a new life in Texas. The first three ships sailed in October 1844, with one trunk per family (and you thought our airline bag fees were tough!). Many emigrants had sold all they had to pay for the trip which was to include passage, transportation from coast to settlement, 320 acres of land, housing, warehouse of provisions, implements, seeds, farm animals, education and churches in the Fischer-Miller Grant. Prince Carl, arriving in Texas ahead of the group, learned that the Fischer-Miller Grant was out in the middle of Commanche hunting territory and too far from the coast. He seriously needed a Plan B. On March 16, 1845, he purchased a 1265 acre tract nestled on the edge of the Balcones Escarpment between two rivers for the bargain price of $1111. With the ink barely dry on the land deal, the Prince and his entourage met the first immigrants at the Guadalupe River on Good Friday, March 21, 1845. Each immigrant was offered a half-acre town lot and 10 acre farm lot, quite a let down from the promised 320 acres. The Adelsverein’s rating went down from there. The next wave of German immigrants arrived between the fall of 1845 and April 1846. More than 5200 people landed in Galveston and Indianola and were left to fend for themselves. There were no wagons because they were hired out to haul for the Mexican War. There was no housing, forcing some to camp for more than six months under tents, exposing them to harsh winter weather conditions on the coast. An epidemic broke out, with more than two-thirds of the immigrants falling ill. Of those who decided to travel onward to New Braunfels, proportionately few made it. They brought the epidemic with them, losing family members along the road and infecting their new town. Instead of being greeted by a Prince, the sick and starving immigrants arrived to see the river swollen from floods, unable to cross. They were promised provisions of food, finding instead nothing on hand but cheap “unwholesome beef”. How do we know these things? Whatever did we do before Ancestry.com? Much like people document their lives in photographs or on social media, people wrote accounts of their travels in diaries, journals and letters back home. And just like today, important actions were recorded in the minutes of meetings of government and social organizations, providing us all a wonderful treasure trove of what early New Braunfels was like. Except, it is all in old German. Enter Oscar Haas and his curiosity. Oscar Haas was born in October of 1885, at Cranes Mill, a third- generation descendant of German colonists in Texas. His ancestors were among the 5000 immigrants landing in Indianola in the fall of 1845. He moved with his family to Blanco County and then in 1897 to New Braunfels at age 12. He attended the old New Braunfels Academy for third through sixth grade before going to work in a grocery store. He worked his way to a dry goods business partnership. In 1934, at age 49, Haas was elected Comal County treasurer. For twenty-eight years he served the county. It was during his time in the courthouse that he discovered the original Commissioners Court minutes book of 1846. His discovery immediately sparked a lifelong interest in our history and sharing it with others. He began writing articles about the details of the court minutes for the Neu Braunfelser Zeitung (German) and the New Braunfels Herald. Now remember, the minutes were in old German script. He actually copied and hand wrote the full translations of the documents on whatever scraps of paper he had – the backs of calendars, old election ballots, etc. before writing the articles. In 1944-45, he wrote the columns “99 years ago” and “100 years ago” before the city celebrated its Centennial. He continued to write articles until his retirement in 1962, when he focused his energies on writing a book, History of New Braunfels and Comal County, Texas 1844-1946. 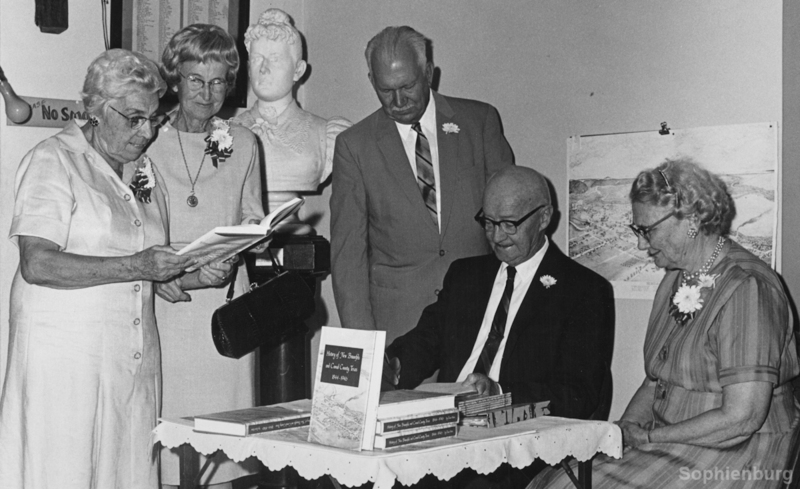 Published in 1968, it was the most comprehensive book written about the founding of New Braunfels, becoming the bible of local historians and genealogists. 2018 marks the 50th anniversary of the book. It is still in print (fourth printing) and can be found at Sophie’s Shop inside the Sophienburg Museum and Archives. Here’s to Oscar Haas, successful businessman and public servant, and most notably a “history geek” extraordenaire.